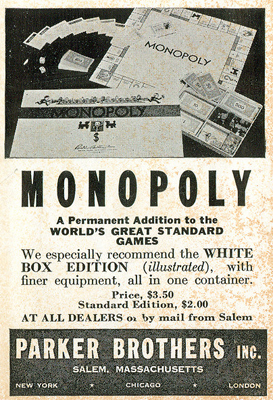 One of the copies of the game was bought by the daughter of the founder of Parker Brothers. She suggested that her father take another look at the game. Parker Brother decided to license the patent rights from Darrow. Very quickly, Monopoly was selling over 20,000 copies a week. It was the best selling game in 1935. Darrow went from working odd jobs to get by to a very rich man quickly with the success of his game. Until the 1970’s, Darrow as the lone creator of the game was the most popular and accepted history of the board game. It the mid-1970’s, Professor Ralph Anspach went to court with Parker Brothers over the Monopoly trademark when he developed a game he called Anti-Monopoly. The case was settled with the parties reaching an agreement that Anspach could still use the name Anti-Monopoly. The suit showed the Darrow did not invent monopoly all on his own. Long before Darrow took his game inspired by Atlantic City to Parker Brothers, there were other games being played that were based on the buying and selling of land. The first known game of this kind was The Landlord Game created by Lizze Maggie. She received a US patent 748,626 on January 5, 1904. The Landlord Game was not distributed until 1910, when she set up the Economic Game Company of New York to produce the game. Still, the game spread by word of mouth and the names of the streets were often changed depending on the region where it was being played. A common version played in the Philadelphia area were Darrow lived used Atlantic City streets. It is now thought that Darrow must have played the Landlord Game or something very similar. Clearly the idea, was not his alone and he does not deserve the full credit. 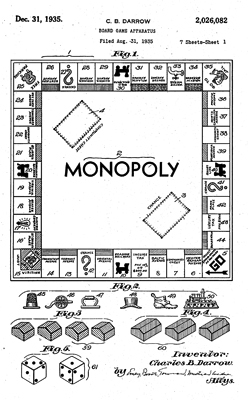 In fact, Monopoly games printed before 1949 include both the patent numbers of Lizze Maggie and Charles Darrow. Today, despite the length of a game, Monopoly is still a very sucessful board game. Over 200 million Monopoly games have been sold. More than 5 billion little green houses have been manufactured. More than 500 million people have played at least one game of Monopoly!!! ← Invention Geek – Yankee Stadium and Thomas Edison?